The Met Office has warned of cold air and temperatures below freezing point as the Beast from the East returns to the UK. Harsh weather conditions will bring sleet, hail and thundersnow. Snow will most likely be limited to northern areas of Britain, but the forecast show southern parts of England and Wales may experience “flakes of snow” as well. And the harsh weather condition will start affecting Britons as soon as tonight or Wednesday morning. MET OFFICE WEATHER FORECAST: WHEN WILL IT SNOW? Mr McGivern said: “For most it’s a cold but not frosty start to Tuesday. “A cold wind blowing in from the east, a stiff breeze there along the eastern side of Britain and that wind will push in more and more frequent showers. “For the western extremities of the UK we’ll keep some brightness, but for most it’s cloudy and top temperatures on thermometers will be 5C or 6C, but it will feel more like 3C or 4C. “Now we keep that north-easterly wind in the northern half of the UK in particular until Wednesday, but the wind does shift direction ever so slightly by Wednesday. “That means that by the early hours of Wednesday we’re likely to see sleet and snow coming in even at relatively low ground, and across parts of Wales and southern England we’ll see some sleetiness with the showers and we could even see a few flakes of snow. 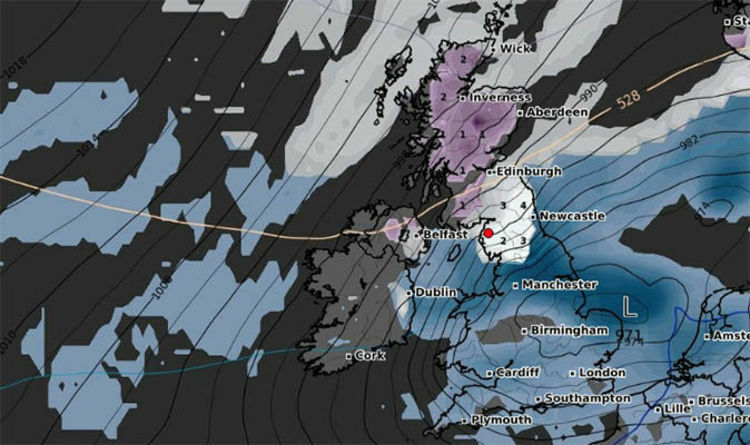 This comes as the Beast from the East looks set to bring record-breaking weather to the UK, according to bookies. Betting company Ladbrokes make it just a 5/4 shot that this goes down as the coldest winter on record. And it's just a 50/1 shot that snow falls in the UK on every day in December. Alex Apati of Ladbrokes said: "We're strapping ourselves in for a snow-filled winter and the odds suggest it could be a record-breaking season." And if the bookmakers are correct, Britons may get a white Christmas this year.